← IS PULWAMA MODI’S 2019 GODHRA ? The “SPICE” (Smart, Precise Impact, Cost-Effective) is an Israeli-developed, EO/GPS-guided guidance kit for converting air-droppable unguided bombs into precision guided bombs. Indian fighter jets carried out airstrikes against targets inside undisputed Pakistani territory, but open-source evidence suggested that the strike was unsuccessful. The most identifiable photo was of the fins, which closely resembled those on the Israeli-produced SPICE-2000 precision-guided munitions (PGM). SPICE uses INS/GPS coordinates for autonomous navigation and electro-optical seekers for target identification and terminal navigation. According to Rafael, the manufacturer of the SPICE series of PGMs, the electro-optical sensor matches the scene with pre-loaded imagery for accurate target acquisition and homing. The video posted on social media showed a valley similar to the one appearing in the video shared by the Pakistan Armed Forces spokesperson. A single cluster of buildings was visible on top of the mountain ridge. Imagery posted by Uppsala University Professor and UNESCO chair Ashok Swain on Twitter showed a closeup of this building, allowing for a clearer view of the area. Using this more detailed imagery, DFR Lab was able to confirm conclusively that this strike did, in fact, take place near Jaba Top. A comparison between tree clusters and the buildings visible in the imagery provided a positive match. Using this information, DFR Lab was also able to verify the initial imagery from the Pakistan Armed Forces spokesperson as being from the same location. In the graphic below, the video footage would have been taken from structure number two as marked in the satellite imagery and ground-level imagery. Retired Indian Colonel Vinayak Bhat seemed to agree with this assessment in an article written in the immediate aftermath of the attack, showing satellite imagery of the same location. The blue roof combined with the half roof covering the road and the side road on the right all contributed to a high-confidence conclusion that these structures were the same. Another video from the main point of impact allowed DFR Lab to better survey the extent of the damage. The video showed a large patch of wooded area affected by the bombing, but no sign of damaged structures or personal injury. Viewing satellite imagery from Planet, a small change in the affected area was visible, indicating the point of impact. Imagery from February 26 was not available, but a comparison from February 25-27 was possible, allowing for a reliable before and after comparison of the target location. The change visible in the imagery indicated only impacts in the wooded area, with no damage being visible to the surrounding structures. 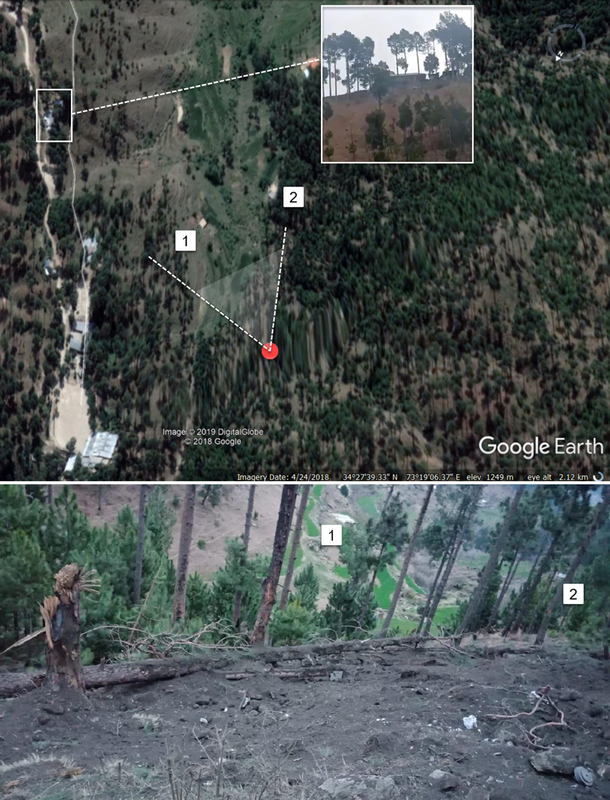 Using open-source evidence and satellite imagery, DFR Lab was able to confirm the location of the Indian airstrike to be near Balakot, rather than inside it, and firmly within Pakistani territory. The target was supposedly a JeM-led madrassa, but DFR Lab was unable to confirm that any bombs reached buildings associated with it. Analysis of commercially available satellite imagery by the International Cyber Policy Centre in Australia has questioned the government’s claim that the strikes on Balakot were successful. According to Nathan Ruser, the author of the report, “Satellite imagery, acquired by Planet Labs Inc. on the morning of February 27 and accessed by ASPI” calls the government of India’s claim “into question”. This entry was posted in Uncategorized and tagged Balakot, Hafeez Saeed, Rafael, Spice-2000. Bookmark the permalink.